Be honest - Answer questions as honestly as possible and don’t try to “sugar coat” things. Be repetitive - It may take some time for children (especially young ones) to grasp the finality of death. Even if it’s uncomfortable for you, address the process of death as often as is necessary. Be open - Don’t be afraid to cry and be sad in front of your children. Letting them know that grief is a natural part of their life will give them healthy coping tools for the future. Be mindful - Pay attention to your child’s behavior and let him know if you notice any changes. 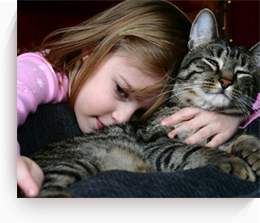 Children that do not appear to be coping well with a pet’s loss may need extra support from a counselor or therapist. Be patient - Grieving takes time. Focus on being supportive instead of expecting children to deal with the loss within a certain time-frame. We are here to support all members of your family throughout the grief process. If there is anything we can do to assist you in your time of need, please don’t hesitate to contact our office.